I've finally decided to register with NDWF after a long time lurking and admiring those groovy LED watches from my youth. After a bit of saving up I bought myself a super NOS Gruen digital (1975??) which *was* in top condition. 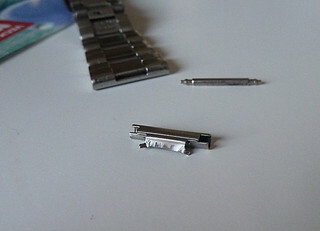 After a bit of a fall (not due to the beer I hasten to add) it's now in several pieces The watch, module and glass are thankfully undamaged and work fine, but the one of the bracelet ends has snapped out and the tiny lug has sheared off. 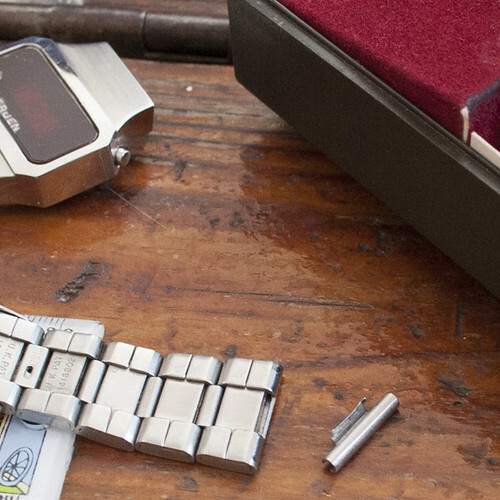 I adore this stylish watch and it's cool brushed steel bracelet. All the watch repair places on the high street in stockholm have advised I just give up and buy a leather strap. Has anyone had any luck replacing these little buggers successfully? Any advice at all (other than "buy a new watch and don't be so clumsy next time") would be well received! Pleased that a solution came along for you, I would still keep the old strap for a spare or for possible repair at a later date. Thanks for the welcome! I've taken a look at the innards of this a little closer and there are some generally odd details. I DO believe the case is NOS and damn fine it looks too. 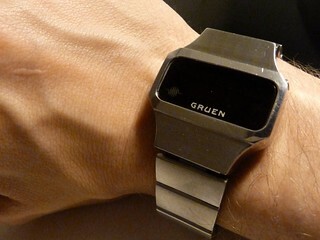 The embossed Gruen logo is beautiful, but would a watch of this vintage really have a generic strap? Also while changing the batteries I noticed the back (written inside) and battery clip are from a Wittnauer. Obviously Hughes module aside, methinks this 'boxed gem' may be a bit of a Frankenstein's monster. As I had the gut feeling, the strap was too big, both at the lug and the shoulder for my watch, so I am back to sqaure one. I got over excited just seeing what looked to the exact same style strap. It is almost certainly manufactured by Prospect, although clicking around I notice many other watch brands share that look (particularly Beltime and NOVUS). Could you use a bit a solder to hold it into position? It could of been made a lot neater but the repair is hardly noticeable when on the wrist. 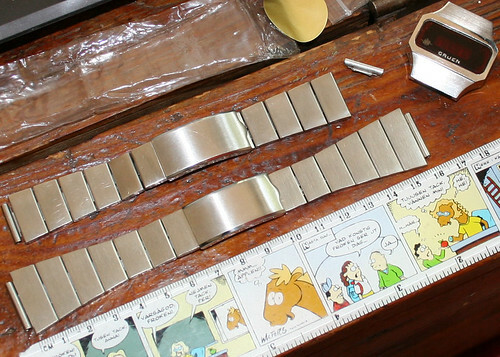 Just wondering if this is the longest restoration project concerning one watch. Necro-bumping my own thread from 2013, this is a quick update to say I not only managed to graft on a lug from a similar strap (by prizing open the tabs on the broken end), but I even managed to source an actual Gruen clasp with the matching "pulse" design featured on the glass. I'm a very happy chappy now.